The Gilded Age in the American experience subsists as worthwhile to study because of its uninterrupted, demonstrated prosperity (curiously corresponding to a legal ban on drink) immediately followed by superficially mitigated disaster and calamity. The Depression certainly carved space for the creation of great works; jazz and photography each had hallmark decades and increased the breadth and depth of its craft. Advances in telecommunications, regardless of who could afford them, allowed for this art to democratize and to offer at least a distraction and at most a joy to millions of people who had nothing now but drink and unsalable assets. Authors who write about this transitory time ex post facto get the benefit of knowing in advance what came next. What makes The Great Gatsby brilliant makes its later Contemporary American Novels not so much: perspective, of which we know Scott Fitzgerald had little. 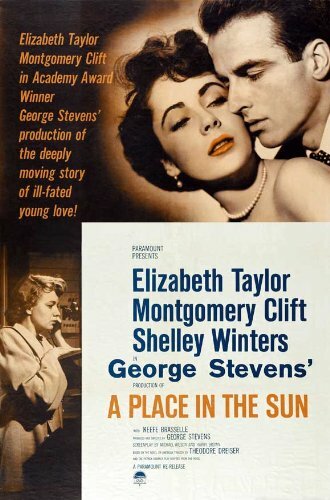 Fitzgerald’s contemporary, at least in epoch, Theodore Dreiser, wrote a book called An American Tragedy, which would eventually bastardize its way into A Place in the Sun, a 1951 film that showcased Montgomery Clift and Elizabeth Taylor. Unlike the book, whose plot developed slowly and canonically, the movie saw its lead characters smush together into a love triangle that convinced no member of its audience of its emotional heft. The key to Clift’s character, a naive and unassuming nephew type, is believing that plot points happen to him and that he is in control of nothing. Only after he falls in too far does an audience understand that the avariciousness is borne of self-preservation not of circumstance. The character study is trying to piece together how much of the behavior is nature versus nurture. When, as A Place in the Sun insists, the “love” between leads is forced for the sake of time or convenience, our character palate becomes not a band of misfits, but contemptuous mallards. Forget the antihero trope that Gatsby pulls off with aplomb (that each character is a self-serving product of nature), this trope, the speedy drive-thru love, is a film killer and should have died on the cutting table. Once an audience becomes aware that a couple is “in love” as a consequence of script rather than a consequence of happenstance or of unreconciled devotion, the story is dead. It holds no more emotional depth upon which to build plot; each action is built on an unshakable lie. Further characterization is also irreverent unless the next step in development is serious meta-reflection—“why am I here?” or some similar pathos. Usually, there is not enough film time for movies to trace its plot in reverse like this; it becomes too difficult to justify consistently, unless the whole plot of the movie is about self-reflection and tempering impulse this type of storytelling is cumbersome at best, miserably morally bankrupt at worst. A Place in the Sun sits firmly on the latter end of this spectrum. Most modern films avoid this for good reason, or start the plot in media res, asking the audience to accept the facts as presented at face value, at least for the time being. The manner by which A Place in the Sun is structured does not ask the audience to do this; its execution is lazy. With the culmination of the plot in ultimate violence, instead of sorrow, the audience must feel indifferent to the fate of Clift’s “George Eastman.” This character holds neither a Carraway nor a Gatsby candle. On his dark path to death, God speaks: here comes a man who learnt nothing, was taught nothing, and whose death had no place in no sun forever and ever. A Place in the Sun lost, rightly, to An American in Paris, which wrongly beat A Streetcar Named Desire. Streetcar normally wins on Marlon Brando’s performance alone (ask contemporary critics to rescore this) but likely didn’t stir the American spirit the way Gene Kelly did dancing and singing, set to Fitzgerald’s colleague, George Gershwin’s ultimate standards. In a return to normalcy, the American experience did not demand more death, at least not like A Place in the Sun’s. Don’t even start on the empty mess that is Quo Vadis.